The scheme designed by Ian Ritchie Architects works with the historic context and architectural grain of this formerly neglected part of Covent Garden to create a vibrant, elegant new area of public space. A contemporary central piazza forms the focal point of the development, which contains residential apartments, shops and restaurants. The Sainsbury Wellcome Centre for Neural Circuits and Behaviour at UCL is one of the first buildings ever designed incorporating latest neuroscientific knowledge into its fabric from inception, and in open collaboration with its prospective neuroscientist users. The RIBA national award-winning, now iconic Courtyard Theatre designed by Ian Ritchie Architects has been transformed into a vibrant, naturally lit collection of dramatic theatre performance spaces over five floors within the original, naturally weathered folded Corten steel sheet envelope. The Spire Monument in Dublin’s centre was inspired by and reflects the ever-changing light and composition of the Irish skies. The elegant and remarkably slender form continues the tradition of standing stones and obelisks and was designed to embody an optimistic and far reaching spirit of contemporary Ireland. All theatre production activities in Plymouth Theatre Royal’s TR2 are centralised and integrated with educational and rehearsal spaces. The design’s most striking elements are rehearsal pods, clad in a unique woven phosphor-bronze cloth, soft to eye and hand, ‘randomly’ placed on the rock riverbank. Ian Ritchie Architects’ design for a permanent Concert Platform in Corten steel in London’s Crystal Palace Park is sculptural without being sculpture, bold yet reinforcing the surrounding rich and beautiful Paxton landscape. Nevertheless, its simplicity belies the complex acoustic performance required of it. This 3,000m2 research office building was designed for the Prudential and Magdalen College JV. The building ‘floats’ above undercroft parking, the entrance is sheltered and east and west facing windows are shaded by horizontal veils of stainless steel mesh. The design provides adaptable accommodation for single or multiple occupancy, and the environmental controls permit natural ventilation through to full air conditioning. Ian Ritchie Architects were commissioned by Stanhope to design, detail, supervise and deliver a multi-tenancy research-office building of 9,000m2 within 52 weeks to a fixed budget at the renowned Stockley Park. We developed the first double glazed Planar with Pilkington for the external walls. The finished building gave 92% net rental area and received several awards. Ian Ritchie Architects led the design and realisation of the world’s largest glass hall for the new Leipzig International Exhibition Centre in collaboration with gmp. Combining simplicity of concept and construction with elegance and economy, it appears as a filigree shell within the site’s central landscape. Ian Ritchie Architects designed the three iconic 35m high glass circulation towers giving the new Reina Sofia Museum of Modern Art in Madrid its architectural image. It was the world’s first glass installation which transferred wind load through the corner glass panels. Ian Ritchie Architects helped conceive and develop the structure and glazing designs of the 6,000m2 roofs covering the three internal courtyards of the Louvre’s Richelieu wing, creating the Museum’s new Sculpture Courts proposed by I. M. Pei & Michel Macary. 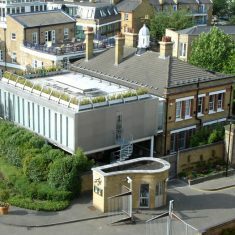 By the 1990s iRAL had become world-renowned for their glass structures, material-technical innovation and intelligent environmental and sustainable design – of which iRAL’s most recent major project, the Sainsbury Wellcome Centre for Neural Circuits and Behaviour, in London, completed in 2016, is an evolution. iRAL has won over 60 competitions in Europe and the UK and received over 80 national and international awards. A career in architecture engages with so many disciplines and aspects of life it is impossible not to enjoy it. The cyclical phenomena of nature – day following night following day, the life-regenerating cycle of the seasons – provide evidence for the Taoist paradigm. Successes and failures in architecture are part of the duality of being alive – happy and sad, good and bad, life and death. I am reminded that no amount of darkness can extinguish a candle’s flame. This is why, for me, optimism always prevails. Architecture provides a physical reference to our cultural past and, at the point of conception, both expresses and gives us confidence to imagine a better future. Beyond utility and aesthetics, built architecture has a metaphysical role - it shapes the emotions and behaviours of those who will live with it. A metaphysical inquiry into the nature of space, structure and light is essential to envisage architecture that will lift the human spirit. When the elements of this trinity are in harmony, a tangible sense of wholeness and serenity imbues an architecture that is able to touch the mind through the observer’s senses. Architecture makes the existential tangible, and our sense of place is both a response to our physical environment and a cultural creation. Ian Ritchie will be giving the annual WCCA Lecture on behalf of The Master, Barry Munday, at the Royal Academy of Music’s Susie Sainsbury Theatre in the evening of 29th May 2019. The lecture will be followed by a reception in the Angela Burgess Recital Hall. We are delighted to announce that iRAL and James Johnson & Co have won the Fit-Out and Interiors category of the AJ Specification Awards 2019 for the Royal Academy of Music. The judges were unanimous in their decision and described the project as an ‘immaculate piece of work’.